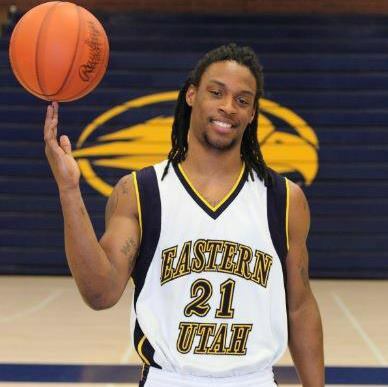 USU Eastern 2012 alumni, Bubby Johnson, has done something that no other athlete in the history of the school has ever done . . . won a D2 basketball title championship with his team. As a member of Florida Southern College, Johnson and his teammates handily defeated Indiana 77-62. The team made 13 three-pointers to seal the victory on Sat., March 28, in Evansville, Ind., at the Ford Center. The team lost only one game in 37 with an all-senior starting lineup to get to the national stage. Johnson had a team high of eight rebounds, 11 points, three assists and two blocks. “It was pretty neat to see a former captain here at USUE play on national television and win a national championship. It is quite an accomplishment,” said Coach Vando. In an online interview on Monday, Johnson said he is still on cloud nine and that it really hadn’t hit him yet. “When the confetti went off, I just looked at my nearest teammates and started grabbing them. We talked all year about getting here and for it to happen is amazing. “I remember when I was visiting Utah for a month last summer, I would workout in the sand volleyball court connected to the LDS Institute of Religion. Johnson, a 6-foot-8-inch guard/forward from Silver Spring, Md., played for coach Vando Becheli from 2010-12 and served as captain of the team. When not playing basketball for the Eagles, he coached eighth and ninth grade students from the area to compete in the AAU basketball. He also volunteered at Castle Heights Elementary School every Friday where he read to the students, graded their papers and tested their skills. “He always worked very hard, and was always being a leader. He was a complete package with a lot of discipline on and off of the court. He was also very involved with the community. He is a competitor and it is no surprise to see his success,” said Vando. What’s next for Johnson? He plans to graduate with his bachelor’s degree in communications.